Helloo foodies! How are you all? Ohh…..after a long time I meet you! Hope you all are well. My holidays were very nice…..enjoyed lots! Now, it’s time for a new recipe. Today, we all have celebrated Onam festival. It’s one of the most colorful festival of India. So, I want to share a special recipe today. Hope you like it…….. 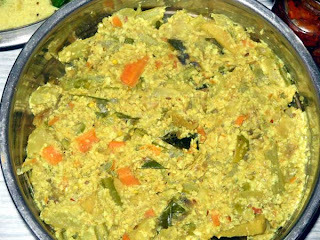 Grind together the coconut, green chilies and cumin seeds to make a fine paste, adding very little water. Mix the curd to the ground paste and keep aside. Peel and chop all the vegetables into medium pieces. Cook the vegetables with very little water, salt, turmeric powder and 2-3 curry leaves. Heat the oil. Add curry leaves, cooked vegetables, turmeric powder, salt and mix well. Add the past and stir well. Cook for 5min. * You may add more vegetables in it. *You may garnish with grated coconut. 1. Drink one glass of light worm water with 1 tablespoon honey and juice of lemon (½) in the morning (before breakfast); it’s very helpful to prevent obesity and good for your skin too. 2. Cucumber is natural toner. Use cucumber juice with rose water on your face after cleansing; it works like magic to refresh your skin! 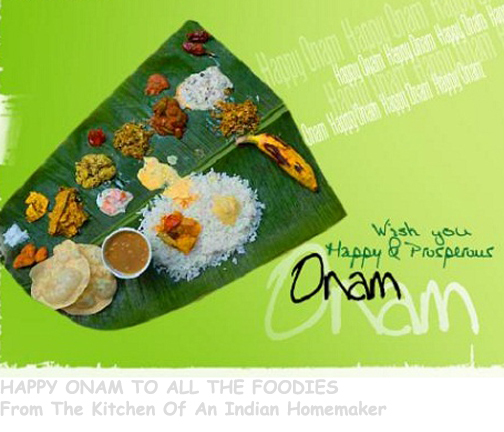 Onam as everyone knows is the national festival of Kerala, is a time of jubilation and celebration. But Onam is also a great time for the monkeys in a temple in south Kerala. During the Onam season these monkeys are served a grand feast. Please name the temple where this unique offering is made? Question 4. Ans. The fifth avatar, Vamana, appeared in the Tretayuga in order to destroy Bali, the king of demons. He came during a huge ceremony conducted by the king and cleverly asked for just three feet of land, measured by his own small feet. Vamana covered whole of the earth and the heaven, subduing Bali into his feet. That’s all for today. Enjoy the festival with your family and keep smiling. Please feel free to write your opinion. Take care. Namaskar. hi Koyeli Happy Onam ! yw Koyeli- its a great start you have made. All the BEST to you! !